Tom Cruise let his guard down for the Late Night With Jimmy Fallon on Friday as he played a game of egg roulette with the show host and lost. Tom Cruise, 50, picked from an assortment of raw and boiled eggs for the gag, and found out soon in the game things were about to get really messy. The actor and the show host took turns picking from a carton holding eight boiled eggs and four raw eggs and smashed their chosen egg against their head. The game ends when someone breaks two raw eggs on their head and loses. Tom Cruise went first and promptly smashed a raw egg against his hair, prompting Jimmy Fallon to double over in laughter. “I told you I didn’t have a good feeling about this, man,” Tom Cruise told Jimmy Fallon with a smile. Jimmy Fallon went next and picked a hard-boiled egg. Tom Cruise on his second pick again chose a raw egg and broke it against his head. It wasn’t the first time that Tom Cruise and Jimmy Fallon squared off. They went eye-to-eye last December in a Water War game, which is based on the card game War and includes lots of water. The winner of each hand got to douse his opponent with a cup of water and the first to run out of cups won the right to blast the loser with a toy water cannon. 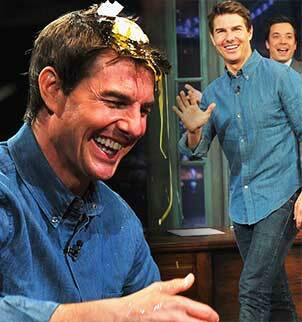 Tom Cruise won and thoroughly drenched Jimmy Fallon. The Hollywood star has been making the talk show circuit lately to promote his new sci-film Oblivion. Tom Cruise visited Jimmy Kimmel Live! on Thursday night and also took part in a skit. Jimmy Kimmel gave Tom Cruise an acting challenge by having him deliver ridiculous lines in a dramatic overtone. “Is there a way to get the soup and the salad?” Tom Cruise asked as he was illuminated on the couch with a spotlight. The actor ended the dramatic query with his patented muscle-flurrying jaw clench. In his new movie, Oblivion, Tom Cruise plays Jack Harper, a former Marine commander, in the sci-fi flick set in a not-too-distant future of 2073. Jack Harper is stationed on a fallen Earth following an alien invasion 60 years earlier. The character comes across an enigmatic stranger played by Olga Kurylenko who crash lands in a spacecraft and Jack Harper is forced to question what he knows about Earth’s near-destruction and life as he knows it. Oblivion also features British star Andrea Riseborough, Melissa Leo and Morgan Freeman and opens on April 19.